Indicating DRIERITE ® in this plastic unit dries air and gases for small scale laboratory applications. A rubber hose connection provides an immediate flow of dry gas. Note: Do not use this plastic unit in the presence of vapors or liquids containing phosphate esters, synthetic lubricants, hydrocarbon solvents, methanol, acetone, lacquer solvents, or other organics. Indicating DRIERITE is a distinct blue color. When its drying capacity is exhausted, it turns to pink. 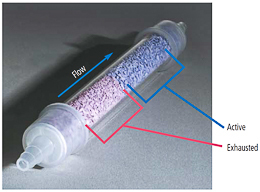 Indicating DRIERITE gives constant visual assurance of active desiccant. Construction: Tube is polycarbonate. End caps are molded polypropylene. 20 Micron polypropylene filter in each end.